we suspected the chimney right away. when we had a chimney inspection done during escrow, we were told that the chimney was cracked at the roofline. james has also been on the roof before and seen how shoddy the flashing and shingles are done right around the chimney. 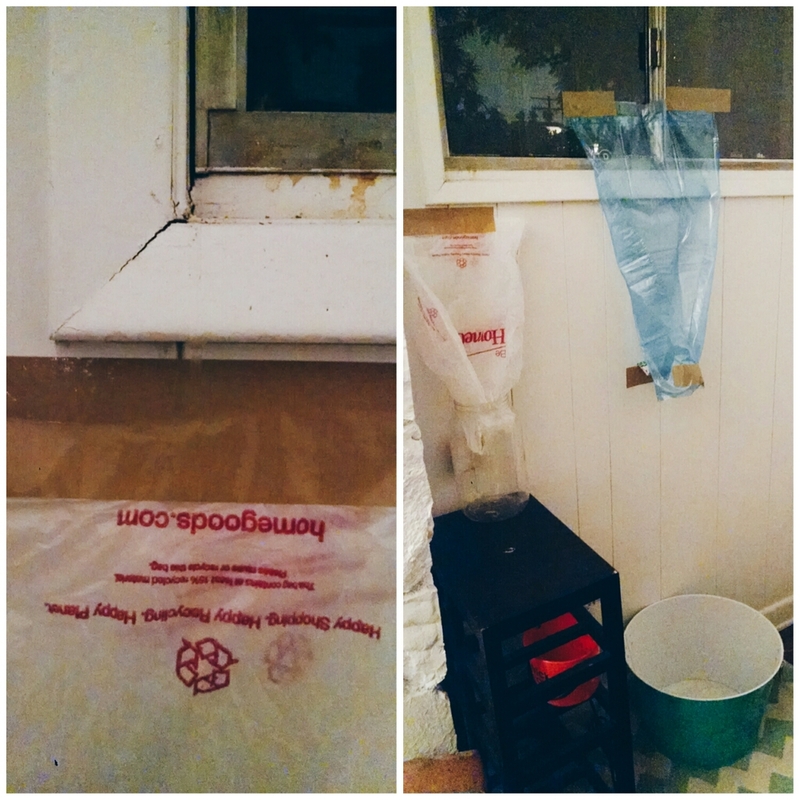 we did our best to direct the leaking, especially since there is an outlet and the router right under the window. since the water was coming in the seams of the window, we couldn't even just put down a bucket, but used plastic bags and packaging tape to get it up off the walls and drip into our chosen receptacles..
in anticipation of the rain we are supposed to get this week, james went up on the roof and rubber-spray-patched all around the chimney on saturday. yup, we totally bought a $13 can of (as seen on tv!) flex seal from target. i didn't go on the roof myself, so i don't have any pictures of his handiwork, unfortunately. the january cure : day one. as i mentioned earlier today, i'm going to try and to participate in and liveblog apartment therapy's annual january cure this year! it's day one and the assignment is this: make a list of projects. more specifically, set aside an hour or so to do a walkthrough of your home and make notes on any trouble spots as you move through each room. it's quite an extensive list - and that's with leaving out all the renovations we want to do eventually, as that's a whole other can of worms. i even took and included unflattering photos of most of the rooms as they are now, without doing any picking up. here goes..! get rid of "the sock pile"
Clean. Clean. Clean. ShopVac the heck out of the place. Clean up old lumber stacked in "carport"